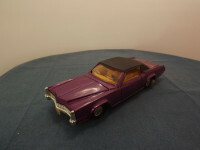 This model is the Dinky 175-H-2 Cadillac Eldorado in Metallic Purple with black textured roof. The model features opening doors which reveal the orange plastic interior with folding front seats. This model is has a black steering wheel set into the dashboard. The grille, headlights and front bumper with yellow paper number plate [65 441 H] are silver painted plastic attached to the metal body. The tail lights are painted red. The bonnet opens to reveal a silver chromed plastic engine and the boot opens to reveal the luggage compartment. The glazing is clear all round with molded front windscreen wipers and rear view mirror. The opening side doors have the glazing positioned to represent half opened windows. 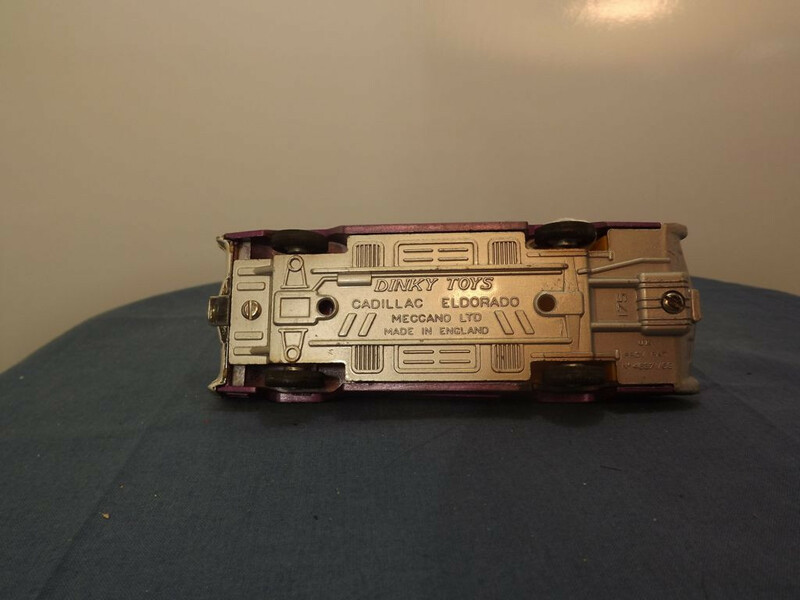 The baseplate is silver painted metal in the centre of which is "Dinky Toys", followed by "CADILLAC ELDORADO", then "Meccano Ltd" and "Made in England" on four lines. The patent "UK, Prov Pat, No46371/68" appears to the rear behind the rear wheel and the model number "175" is to the rear centred behind the representation of the lower petrol tank. The rear of the base incorporates the rear number plate molding with yellow paper number plate [65 441 H]. 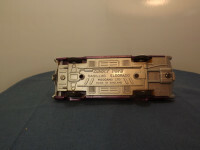 It is held in place by two small self tapping screws, front and rear. All wheels are of a cast metal type - solid one piece patterned metal hubs, with a separate black "rubber" tyre. 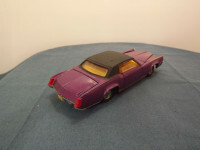 This model was issued between 1969 and 1973.